Postwar postcard map of the Balkans including Albania, newly-created Yugoslavia, independent Hungary and Ukraine, expanded Greece and Romania, and diminished former Central Powers Bulgaria and Turkey. Superficie . . . 290 000 sq. km. Population . . . 16 000 000 hab. (50 par sq. km. Capitale: Bucarest . . . 338 000 hab. Superficie . . . 100 000 sq. km. Capitale: Sofia . . . 103 000 hab. En Europe (y compris la Crète et les iles) 200 000 sq. km. 6 000 000 hab. 30 p. sq. km. En Asie mineure . . . 30 000 sq. km 1 300 000 hab. 43 p. sq. km. Total 230 000 sq. km. 7 300 000 hab. 32 p. sq. km. Smyrne (Asie) . . . 350 000 hab. Athènes . . . 175 000 hab. Andrinople . . . 70 000 hab. Pirée . . . 70 000 hab. Superficie . . . 2 000 sq. km. Population . . . 1 100 000 550 par sq. km. 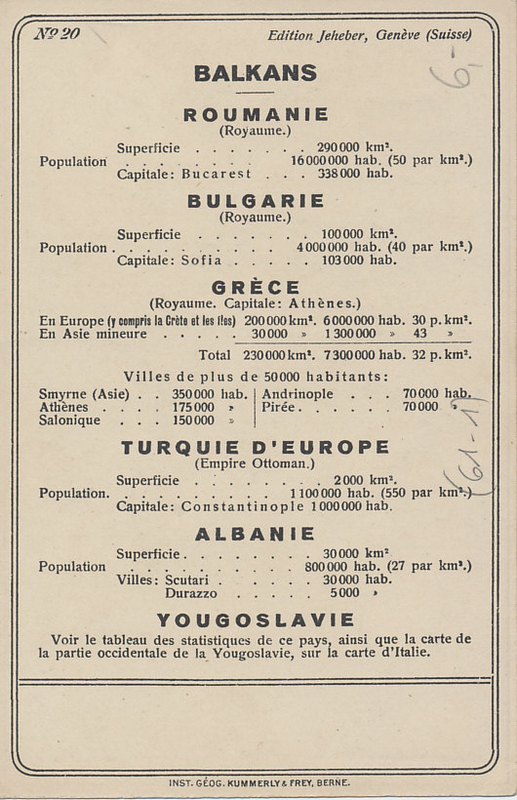 Capitale: Constantinople 1 000 000 hab. Superficie . . . 30 000 sq. km. Villes: Scutari . . . 30 000 hab. Durazzo . . . 5 000 hab. Voir le tableau des statisques de ce pays, ainsi que la carte de la partie occidentale de la Yougoslavie, sur la carte d'Italie. Inst. Géog. Kummerly & Frey, Berne. See the table of statistics of this country, as well as the map of the western part of Yugoslavia, on the map of Italy. 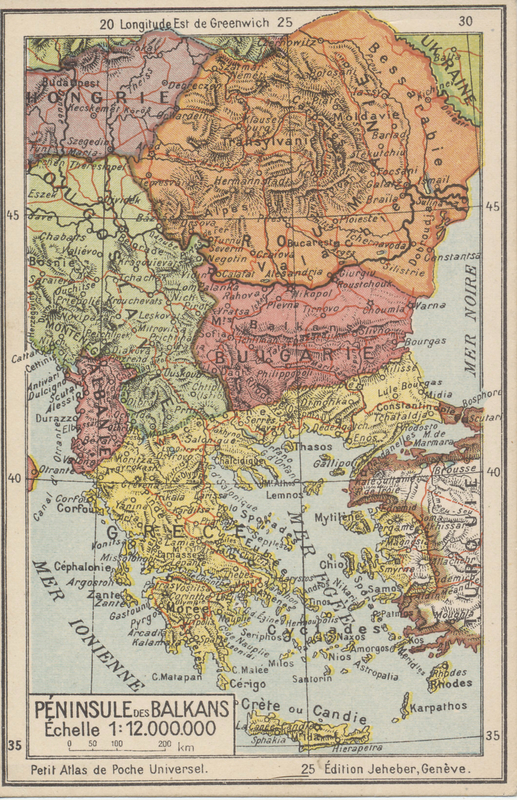 With the Austrian Empire, Hungary was one of two nations within the Austro-Hungarian Empire. The Empire centralized the military and the finance and foreign ministries in Vienna. Hungary had its own Prime Minister and parliament in Budapest. Kaiser Franz Josef was Emperor of the Austrian Empire and King of Hungary. With Austria-Hungary's defeats in the Galician battles of 1914, only the successful defense of the passes in the Carpathian Mountains prevented Russian forces from advancing across the Hungarian plain to Budapest. Relations between Austria and Hungary were strained during the war, and Hungary sometimes refused to ship food to Austria. On August 27, 1916 Romania declared war on Austria-Hungary and invaded Transylvania which had a large Romanian population and bordered Hungary. On November 2, 1918, as the Empire was breaking apart, the Hungarian Republic recalled all Hungarian troops. Hungary is a country in Austria-Hungary. The First World War: Germany and Austria Hungary 1914-1918 Herwig Holger H.